Druid Theatre chairman Seamus O'Grady, Jackie O'Halloran Bernstein, Druid artistic director Garry Hynes and Quinnipiac president Dr. John Lahey. Photo by James Higgins. In July, Galway’s Tony-winning Druid Theatre Company presented a mini-retrospective of Irish playwright Tom Murphy. Held in New York City, the festival, DruidMurphy, featured three productions – Conversations on a Homecoming, A Whistle in the Dark, and Famine – all directed by the Druid’s famed artistic director, Garry Hynes. The Druid Theatre Company exposes audiences across the globe to contemporary Irish theater. DruidMurphy sets out to display works which, though written as much as 25 years apart, reflect similar themes of emigration, nationhood and identity. With the support of Quinnipiac University in Hamden, CT, which, under the presidency of John Lahey has been dedicated to spreading knowledge about the famine, DruidMurphy is a resounding success in its effort to present artistic insight into Ireland’s great tragedy. This fall, Quinnipiac will open the Ireland’s Great Hunger Museum, the world’s largest collection of famine art, artifacts and printed materials, in Hamden. 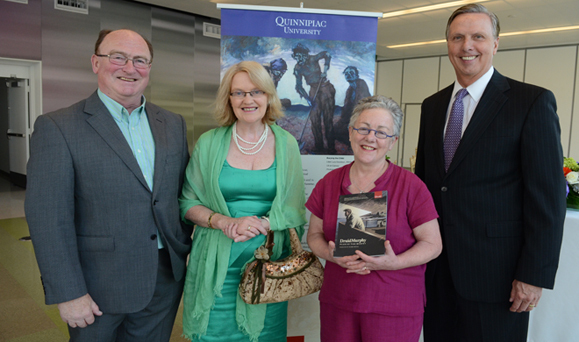 Jackie O’Halloran Bernstein, Deputy Consul General of Ireland, applauded Quinnipiac for bringing Murphy’s important voice to the U.S.“This play cycle […] explores important and often painful themes in Irish life and culture, principally the famine and emigration. The themes have continuing relevance to Irish people in Ireland, and for the Irish diaspora. In this context, the co-sponsorship of DruidMurphy by Quinnipiac University is appropriate and visionary,” she said. DruidMurphy will return to the U.S. October 17 – 20, at the Kennedy Center for the Performing Arts.